Ducati’s Monster range of naked bikes goes way back – variations on the basic Monster theme have been in production since 1993. The company currently lists five Monster models, although in South Africa we only have three; the 821, the 1200 and the 1200S. 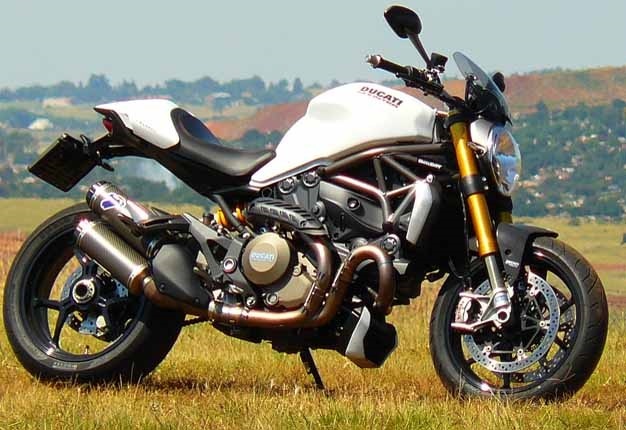 The Monster 1200 was one a finalist in the 2014 SA Bike of the Year and when Ducati offered Wheels24 a 1200S for review, we took the opportunity to spend more time with the bike. With its exposed engine and trellis frame, the Monster is a naked bike in the true sense of the word. There is very little bodywork – a fuel tank, radiator trim and a rear-seat cowl are the only things that break the stark functionality of engine and frame. On a standard Monster, wind is a major problem at speed, but the test model was equipped with a tiny but surprisingly effective after-market screen. If you own (or plan to buy) a Monster, I would highly recommend fitting a screen – it increases no end the bike’s open-road utility. The Monster is not intended as a tourer – it's a street-fighter, plain and simple, packing a mighty wallop in as light a frame as possible. It is designed for short, quick rides around town, or to add true Italian flair to your daily commute. As a result, I found the seating position somewhat awkward: the handle bar felt too wide and there was too little room between the right-hand foot peg and the exhaust’s heat shield. However, it only took a few days for my body to adjust, and although the foot peg problem didn’t disappear, I made peace with it. Having previously marvelled at the smoothness of the gearboxes on other Ducati bikes, I was surprised at the clunkyness of the Monster’s box. It felt spongy during gearshifts, both up and down, and was actually difficult to put into neutral if you happened to stop at a traffic light with the bike in gear. On the upside of the transmission is the fact that the bike is equipped with a slipper clutch, which allows you to make full use of engine braking without rear wheel hop. Öhlins suspension on the 1200S helps in the handling department, and the bike excels at "slow in, fast out" cornering. The Monster is powered by the second generation of Ducati’s Testastretta 11° Dual Spark engine (Testastretta means ‘narrow head’). Dual Spark ignition uses two plugs per cylinder to ensure complete combustion in a very short time. This engine is unique to the Monster 1200 range, being designed as a structural element of the frame; Ducati says the air intake and exhaust have been tuned to give increased torque at low to medium revs. This seems to be working – the bike felt much more powerful than the power/torque figures would have you believe. More than two-thirds of its total torque is on tap from 2500rpm and from there it just keeps getting better. Give the throttle a hefty twist and the eight-level traction control has its work cut out to keep the Monster from shredding its rear tyre. When wheelspin is detected the traction control system electronically retards the ignition to reduce the engine's torque until grip has been re-established. Traction control can also be deactivated if you wish. Despite its performance, the Monster turned out to be surprisingly economical for its engine size. Without my trying to ride deliberately economically, the Ducati returned a fuel consumption of 5.1 litres/100km in mixed riding. This translates into a very decent tank range of almost 350km. The Panigale-inspired full-colour TFT instrument display lacked a fuel gauge (there’s a low-fuel warning light) but is otherwise quite comprehensive. The background changes from white in daylight to black at night, and the information displayed changes according to the selected riding mode (Urban, Touring, Track), although these can be overridden by the rider. The Monster is not for everybody - a case of horses for courses. If you're looking for a practical bike you’d do better to look elsewhere but if you're looking for a machine that is both great fun and extremely accomplished, and has oodles of attitude to boot, look no further.